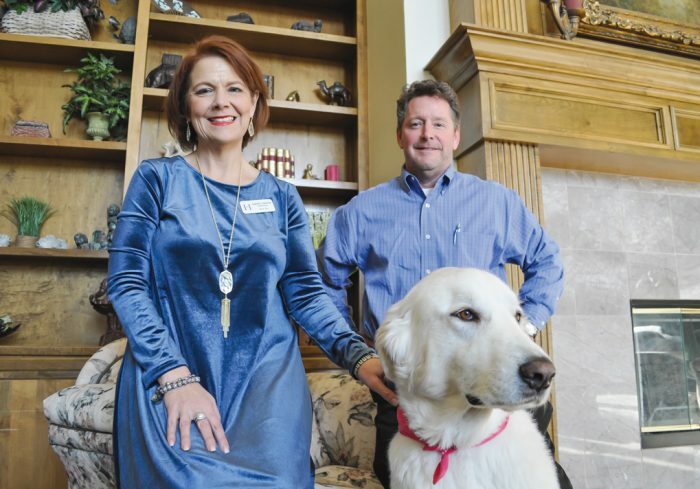 Heritage Assisted Living Center Director of Admissions Kimberly Brinner, Director Curtis Aduddell and Chief Canine Officer Cotton have created a warm, inviting atmosphere for seniors in the metro. 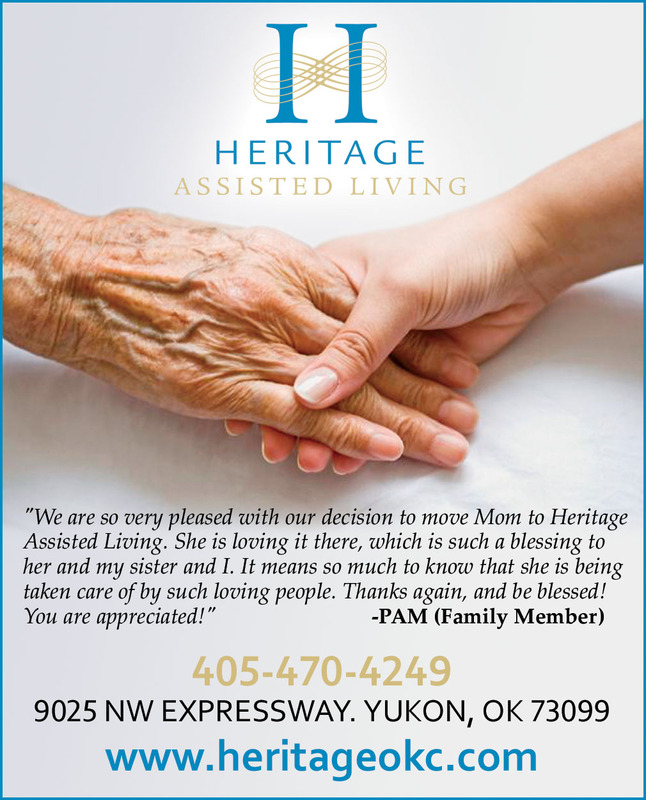 Heritage Assisted Living has been in Curtis Aduddell’s family for 17 years. The director realizes when he comes to work every day he’s walking into someone’s home. He’s proud of that. And walk the halls of the Yukon residence for a few minutes and you’ll quickly see he’s not the only one. “More laughter going on here than any other facility around, I’ll bet you,” said resident Jane Carter. There’s life in these hallways. The sound of people laughing. The smell of chicken enchilada soup simmering on the stove in preparation for dinner. Joan Dark’s residence is just 10 feet down the hall from Aduddell’s office. His door is alway open, usually with Chief Canine Officer Cotton’s head poking out. Aduddell’s affectionate, gentle and patient Great Pyrenees knows every resident by sight and visits with them on a daily basis. In 2015, Dark sold her house and moved into independent living. Less than a year later she realized the move didn’t solve the day-to-day chores of cleaning, cooking and shopping. A friend suggested Heritage Assisted Living. “I love it here,” Dark said. And one of the things she loves is the access she has to the man in charge. She’s used that access on a couple occasions but mostly she pops in just to say hello. “A lot of people like the fact they can go to somebody that can at least give them an answer. Whether the answer is yes, no, this that or the other you don’t have to run it up a corporate chain of command,” Aduddell said. The open door policy is just one of the amenities new residents are offered when Director of Admissions Kimberly Brinner begins the discussion of moving in. From that information a myriad of things begin to fall into place. That’s where the hospitality committee comes in. Sharing stories, memories, tips and feelings of their own personal transitions oftentimes brings it home to people that they don’t have to go through this phase alone. Residents are encouraged to take ownership at Heritage. Whether it be serving on resident committees or leading in other ways the message is clear: Heritage is your home. Dinnertime is a special time at Heritage – largely because it’s driven by what residents want. The food council meets monthly with Chef Felipe Castillo to help craft the menu. Special requests are made and family recipes are shared with Castillo so he can share with everyone. A few years back, residents even opted to restructure dining times and implement reserved seating. Remodeling has already begun at Heritage. A bistro will open along with a workout facility. More open reading areas will be offered. Granite countertops and new flooring are also being installed. Staff longevity reigns at Heritage. Director of Nursing Jodie Spradlin has several night staff that have worked at Heritage for 17 years. Many others are reaching a decade of service to residents. They’ve also done a good job of making a home.